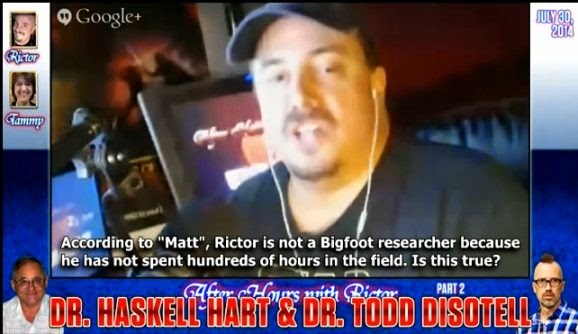 Is Rictor Riolo A Bigfoot Researcher? The term "Bigfoot Researcher" seems to be used pretty loosely by some in the Bigfoot world. While others take the term a little more seriously. Rictor Riolo was recently featured in in Spike TV's 10 Million Dollar Bounty show and apparently learned a few things about evidence collection and the such. Before that I don't think he had gone in the woods a whole lot looking for Bigfoot. On that note, some people do not think he is a Bigfoot researcher because of his lack of time in the field. What do you think? Is Rictor a Bigfoot researcher? Listen in as they discuss these things with Dr. Todd Disotell, who has a few words for Rictor's detractor. Knowing how to collect DNA does not make you a bigfoot researcher or a scientist. Rictor is more of a Bigfoot Fan or a Bigfoot reporter. As for Dr. Todd Disotell - he's a douche.